When you put 'New' in the name of something, it's inevitable that around a decade later someone will smarmily say "it's not new any more", and you just have to accept that putting an adjective like that in a name isn't a long term solution. Yet, when New Super Mario Bros. was released on DS it was entirely appropriate and succeeded in creating a lot of excitement - in May 2006, believe it or not, getting a new 2D Mario game was a special, rare event. Brushing aside spin-offs, ports (or remasters, however you want to regard the 'Advance' games) there was a lengthy gap between bona-fide new 2D Mario platformers. The Nintendo 64 revolutionised platforming with Super Mario 64, and the GameCube stuck with 3D Mario with Super Mario Sunshine. Portables saw re-jigged ports with new and exclusive content, but it can be argued that Super Mario World was - prior to NSMB - the last proper and new 2D Mario game (if we treat Super Mario World 2: Yoshi's Island primarily as a Yoshi game). By the time 2006 rolled around, it shouldn't be underestimated how keen Mario fans were for a back-to-basics 2D platformer with the podgy plumber as the lead character. The New branding, so easy to mock now, was actually a smart move. As the DS took off and started to sell in huge numbers Nintendo was establishing a vast audience of both veteran and fresh fans, so New Super Mario Bros. was a name that intrigued long-term gamers that had waited very patiently for a 2D Mario game, and also made very clear to recent fans of the company that this wasn't yet another port of a classic. With a brand new visual style that utilised 3D assets on a 2D plane - which could be considered 2.5D, let's not quibble over that right now - it looked rather impressive at the time and showed off what the DS could do. 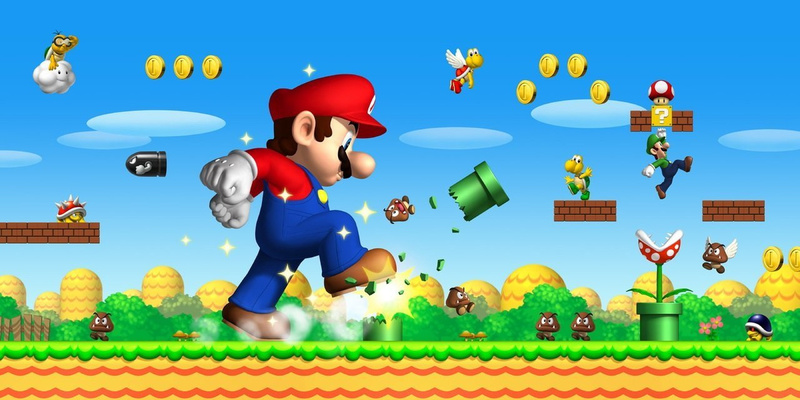 It was a pitch to create new Mario memories for a modern era - blending nostalgia with change. In terms of gameplay, being on the DS it naturally uses the touch screen a little, and even throws in plenty of mini-games. Mario's moveset is tweaked compared to the 'Bit' days, and new and familiar enemies have a fresh look. It's also accessible in a way that's now become Nintendo's standard approach; it's relatively easy to get to the end credits, but finding and accessing all of the secrets needs a little extra effort. As this debut 'New' entry turns 10 years old we can reflect on the fact it made fresh 2D Mario games part of the norm again. 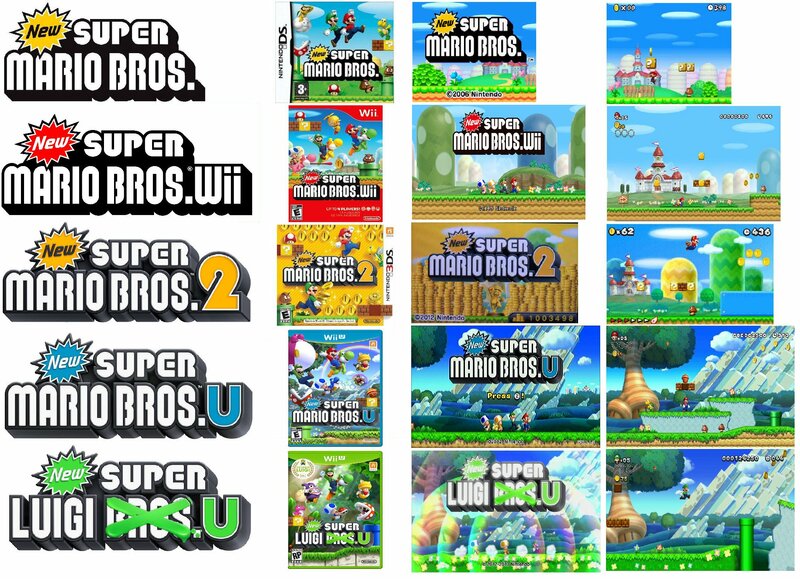 Each system since has had its own game - New Super Mario Bros. Wii, New Super Mario Bros. 2 on 3DS, New Super Mario Bros. U, the latter two even including DLC. New Super Luigi U, for our money, is well worth a look for anyone that's skipped it so far. There was undoubtedly a point, particularly in 2011/2012, when Nintendo's releases and announcements in the series bunched up and there was a bit of over-saturation. That should have passed by now, though it's unclear whether Super Mario Maker has changed the game and Nintendo's approach to 2D Mario releases. Perhaps the next game will ditch the 'New' branding altogether for a tweaked marketing approach; only time will tell. It's important to remember that New Super Mario Bros. on DS was a hugely significant release, however, and has been an incredible success. Nintendo's latest figures show it to be the biggest-selling DS game by a mile, shifting a sensational 30.8 million copies. It's not 'New' any more, but it's an important part of Mario's history. I'd like the next Mario game to be more like Mario 64. I loved exploring a hub world and searching for stars. It sure as hell doesn't feel like ten years. I still clearly remember the day I bought it. Well, "New for the moment Super Mario Bros" wouldn't sound as catchy. Not horrible, but not that great either, in my opinion. Other platformers interest me. These... not quite as much. Enough that I buy them, but I want... more. Super Paper Mario is the perfect template for new 2D Marios. My first 2D Mario game, and it was amazing. I really don't care what anyone says about these series. I still say NSMB and NSMBU are two of the finest platformers I have ever played. NSMB is actually my favorite DS game of all time. I dunno. I could go for some Metroidvania Mario. To put it another way, we need another Super Mario Bros. 2. Not another Lost Levels. Never played this so it would be New to me. I've had enough of new super Mario bros, but not 2d Mario in general. I would like a 2d Mario game with a new aesthetic which has a different structure from the usual map screen, something more like a 2d metroid overworld that links to different levels and plays more like a 3d Mario but in 2d. Are you kidding me? Super Mario World the last proper 2D Mario game prior to the New Super Mario series? Seriously, do people fact-check at all? SUPER MARIO LAND 2: 6 GOLDEN COINS (1992)!!! Oh New Super Mario Bros. You were so much more novel and interesting in 2006. Good times. @DefHalan agreed. even if some of the releases were a bit bunched together, it was still only 1 game per system (+ a great DLC for U). other franchises cram half a dozen games on one console. I've never heard it, but I have to wonder if people complain about the name New York all of the time as well. How about you release NSMB on the 3DS eShop Nintendo? @peeks SM64DS is pretty fantastic but I never played it as much as NSMB. For me, NSMB was hard for me to drop down. In fact, NSMB was the only thing I would play for a very long time. It's that good. Can I also mention that SM64DS's multiplayer pales in comparison to NSMB? Wow, 10 years already? I don't remember the original that much... I was still pretty young when NSMB came out. NSMB is a great game, from what I remember. I had a lot of fun with it. To be honest, I lost interest in this series after Wii. Yes, even NSLU didn't hold my attention for long... and if something Luigi-related doesn't hold my attention, I know I've had enough of it. I'm not the biggest fan of 2D platformers, but I'm glad to see that other's are still enjoying the series. Here's hoping all next NSMB titles will feature a "Maker mode", because given how many WiiUs Super Mario Maker helped sell, Nintendo must know what kind of golden goose they have in their hands. The gate is now open: hopefully they won't close it again and wait for the worst-case scenario to give their customers the "car keys" (always a fitting metaphor to me when it comes to Mario Maker). Because, what with Nintendo being so "protective of their IPs" as Reggie proudly said (and that kind of protectiveness isn't really something to boast about), I fear it will take a struggling console again to see Mario back in his yellow worker outfit. As far as the NSMB series go, I've been glad to buy "the same gameplay over and over" so far, but with Maker out there in the world, the possibility to create stages must become a series staple. Maybe as an unlockable upon completion, who knows? I surely don't want to take Tezuka's admiration for user-made stages (especially the "inspiration for us developers" bit) as a mere survey meant to get new ideas: we want to make levels too, Nintendo! Give us a portable Maker! I wish DS games would go digital too, illustre connazionale, but the sad truth is GBA and DS are forever stuck as a WiiU exclusive. And how dumb is it that there are exclusive past games between two consoles made by the same company? A GBA VC for 3DS, or a DS one, would be a great move to make up for the software drought, especially given E3 is kind of behind the corner. Still pick up and play this sometimes. For me it's better than its sequel although I love both. Can't believe this still costs about $30. That's how you know it's a classic. I always liked the first one. It has that special charm that I haven't felt i the newer entries. Not to mention that you can easily edit it and make your levels, which allow for some really cool stuffs. Nice to see Super Luigi U getting some love at the end there! It's snuck up to be one of my favourite 2D Mario games (although I don't think anything will ever dethrone Mario World as my absolute favourite). I enjoyed NSMBU but the short, sharp levels of Luigi U just suit me down to the ground. In particular I love the challenge of achieving a Super Play on all the levels (sadly it's impossible to do it on some levels and all the boss levels). DS and Wii were fun, I loved them...after all that, it's just "ugh, not this again.". Warioware Touched is a DS game from the My Nintendo rewards. Maybe they're testing the waters and we will get them on the eShop soon (maybe E3/Direct announcement). As for GBA, they could make it New 3DS exclusive. But they promised they won't be selling those Ambassador games ever. So maybe they can offer it as My Nintendo rewards? I've enjoyed these, especially as you get to the later levels, but the look has gotten pretty stale. The co-op was fun, too, but I'm so ready for a refresh. I really hope the 2D or 3D or combined for the NX is a breath of fresh air for the franchise and not Galaxy 3 or another "New" looking game. If they want to do a Mario Maker NX that expands the capabilities to cover all previous 2D Marios to close the book on that style, fine, but I hope to see something a bit daring. @DarthNocturnal How about some Metroidvania Metroid first! I have such great memories of this one. First new 2D Mario game in ages, that was amazing. Sequels were great (Wii, U and Luigi) or just good (2). I never understood why they reused the same backrounds and musics over and over again. Those were a clear minus for me. If there's going to be a new 2D Mario it needs new enemies, new level themes, new music, new everything. I lost my first copy of this game well after completing it and bought it again couple years ago - it honestly hasn't aged as well as I had hoped (or as well as Mario 64 DS). I've played all five of the New games and Luigi's probably my favorite of the bunch, though I much preferred NSMB Wii's effectively unlimited items. Wait, it's been a decade? Wow...time flies by fast! Anyways, it was nice to see the return of 2D Mario...before it just got annoying. This is the game that made me want to get a NDS. This game with my ds when I opened the Mario Red Ds for Christmas many years ago. I had so many good times playing this game. I remember World 4 and 7 being impossible to find (the times where I was stupid and didn't know how to internet). I'm gonna come out and say it. NSMB2 is the best one. Me and the fam thoroughly enjoyed NSMBU. Great music, imaginative graphics and tight controls. Not to mention a solid challenge particularly, in multiplayer, where staying alive and keeping peace on the couch could be very challenging indeed. Quite an enjoyable series all in all. My biggest complaint is a bit small, but they all look alike, and if it wasn't for improved graphics you wouldn't be able to tell the difference easily. Take SMB and SMB3. They both look quite different from each other. These not so much. Multiplayer is absolutely fantastic in this game. A must have mario game, but I miss a mario 64/sunshine style game. Same for DK. Too many 2D DK games not enough 3D. Mario Maker is not a 2D Mario adventure game so they better make more of these or I'll be pretty upset! I really didn't get into the series until NSMBWii (I played the original for the DS, but it really didn't catch on for me). The original NSMB was brilliant. Loved it very much. Some of the latter games were a bit lazy, uninspiring and samey. NSMBU was not a good game to launch the Wii U with. I knew NSMB had sold really well but wasn't aware it's at nearly 31 million. That's bonkers! The New series has always been a letdown compared to Super Mario World or Super Mario Bros. 3. New Super Mario Bros. 2 is one of the worst games I've ever played. My first Nintendo first-party game and my first Mario game!!! You know what else is turning ten this year? Sonic '06. "Ancient" Super Mario World still looks gorgeous and its visual art is still charming. New Super Mario Bros. looks quite ugly with basic and plastic 3D models. 10 years, Four Games, 75 million sales. It's quite impressive thinking about it, to put it in perspective The DS and Wii entries of New Super Mario Bros both did around 30 million each both outselling the biggest Call of Duty games. With New Super Mario Bros U though they've kind of fully realised the graphics of New Super Mario Bros. Considering Tezuka said they're aiming to have the next game top NSMB I'd be pretty certain the next game(for NX or maybe 3DS) will have a different style and branding. New Super Mario Bros. was just what I wanted at the time, it was wonderful to be playing a new 2D sidescrolling Mario game again, and I absolutely loved NSMB Wii, 2 and NSMBU. I have NSLU but I haven't got properly stuck in to it yet. I'm intrigued to see what happens next with Mario, but I've no doubt I'll be there. Just waiting for "New - New Super Mario Bros. 3 3D for >new< 3DS"
@BensonUii Did they outright promise that they would not release the GBA Ambassador games? I thought they simply said that they have no plans to release them. Yeah, back then, a 2D Mario game was something that I wanted to see and I got just that only with a new flavor! After Super Mario Maker, I'm really curious just how Nintendo will make the next one. Probably add a Mario Maker Sequel or bring us another New game? @DefHalan I think it's because all 5 of those are essentially the same. Feels more stale when previously every entry did something different. @MarinaKat each of the New Super Mario Bros games has more variety than say Call of Duty or Assassin's Creed. Well, i think is REALLY confusing!! While I have enjoyed each title in the "New" series, I hope that the "Next" 2D Mario series will drop that brand. My main problem with the "New" games is that they're all basically the same, in both gameplay and aesthetics. It was getting too clinical and felt lazy. The "Next" games (Nintendo NX anyone? hurdur) should go for a new art style (maybe pixels or hand drawn?) and innovate the 2D platformer a bit. Or just maybe try a totally new platformer with a new IP? Splatoon could even work as 2D shooter platformer... but I'm getting off-topic. In any case, here's to another decade of great Mario platformers! Nintendo Life makes you feel old as heck! I've never come close to completing any of the New SMB games... I got the first one for DS back in the day, but I never cared about it, though I really tried to like it. Skipped all the others, except for U, which I got for free in that free game promotion Nintendo had going on a few years ago. Never played anything beyond the 1st level in that one though. Oh, and I played quite a bit of the Wii one at a friend's place. You know, I played the original Super Mario, then I went to NSMB and I realised just how much they tried to shake things up. Hats off to you, Nintendo! While I never played NSMB, I did get NSMB Wii the week it came out; had a lot of fun for months! Didn't really enjoy NSMB2, never played NSMBU, but found Super Luigi U to be an interesting game; being a harder version of Mario U but with minor tweaks. Hopefully the "New" series will be in hibernation for awhile; at least until it gets a major shake-up. It went from novel to lazy pretty fast. Tbh, I never could get into 2D Marios. I mean, I did play through all of them at least once. But I just don't feel the same sense of adventure I felt playing Mario 64, Mario Sunshine and, to a lesser extent, the Galaxy games. I just don't find running from point A to point B that interesting - I always know the way, there are hardly things that distract me from my set path (or rather, are worth being distracted by) and hardly alternate paths. But maybe I'm biased having grown up playing 3D games like Mario 64, Spyro or Banjo-Kazooie. Must be doing well for lasting a decade. Wow, it's been that long, eh? I had NSMB Wii, then NSMB on the DS, then NSMB2 on the 3DS, so yeah...great games in all. I haven't focused on picking them this time around, as other games are demanding my attention, but if you are a 3DS owner, you should get NSMB2...great game! Perhaps get the titles also that were for the DS to add to your collection. Not so new anymore, is it? But yeah, I sadly never played New Super Mario Bros. DS or New Super Mario Bros. 2, although I did play New Super Mario Bros. Wii and New Super Mario Bros. U. Both games I played were quite fun, imo. For me, New Super Mario Bros. was an okay game. I did have some fun with it, collecting all the star coins and opening up the hidden levels....though I could never shake the feeling of dullness when playing that game, at least when compared to my experiences with its predecessors. New Super Mario Bros Wii was my last game from the "New" series. It was also a competent game (and I did love the penguin suit) but I couldn't help but feel burned that Yoshi was only available in what, six levels, and could not accompany Mario out of the level like he could in Super Mario World. Hoping they retire the "New" brand in the next gen - New Super Mario Bros U being the Mario game for the Wii U's launch contributed to me passing on it so far. If Nintendo has to keep that "New" brand what I'd really like to see would be a New Super Mario World done in a fully 2d style like Spelunky HD or Rayman Origins/Legends. Or...an open exploration 3d Mario platformer à la Super Mario 64. Though I think this is less likely to happen. Something like either of those would certainly increase my excitement for the NX a lot. Oh, and tone down those bahs in the music, please? It was cute in the first game, but kinda got on my nerves in the second. I love NSMB and NSMBW, but the newer games are more boring since Nintendo reused almost everything from the previous games. NSMBU almost feels like you're playing the same game as NSMBW, but with better graphics IMO. The first two New Super Mario Bros games were always my favourite ones. Nostalgia's tied to it, y'know.